Exciting surprises coming to the Garden Center this year! 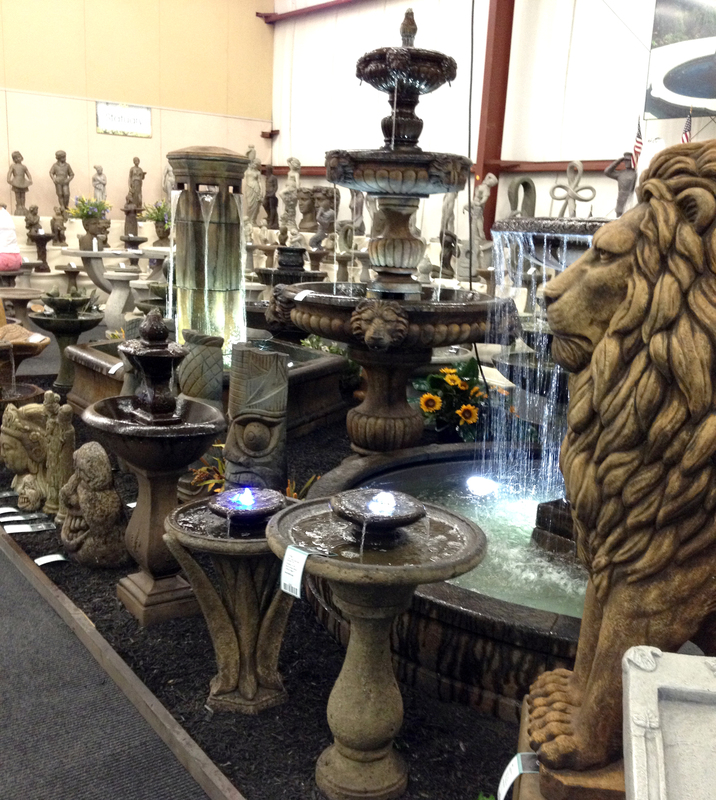 New water features and fountains are coming to the Garden Center! With the count down the Garden Center season opening in the single digits (finally! ), the staff has been busy preparing for a great year with lots of surprises. Because you are our loyal readers and patrons, we are going to clue you in on some things that will be happening soon. First, the Garden Center will be the home for several new water features and fountains. Ed and his staff spent some of their time off visiting a fountain manufacture. Ed is happy to say he was extremely impressed with the company and is happy to offer their products at the Garden Center. To showcase some of these new items, several new water features will be added to Ed’s beautiful Garden Center. The staff will be busy preparing and building these items starting next week. The staff will also be busy building a brand new greenhouse for annuals. With all of the beautiful flowers that will be filling our the Garden Center soon, Ed felt that it was time to update the greenhouse. This project will also begin next week. We bet you can’t wait to see these smiling faces! Many of you are probably wondering if we are going to have events again this year. Yes! We most definitely will be. Get out your calendars, you are the first to know about these events! We will announce seminar dates at a later time. 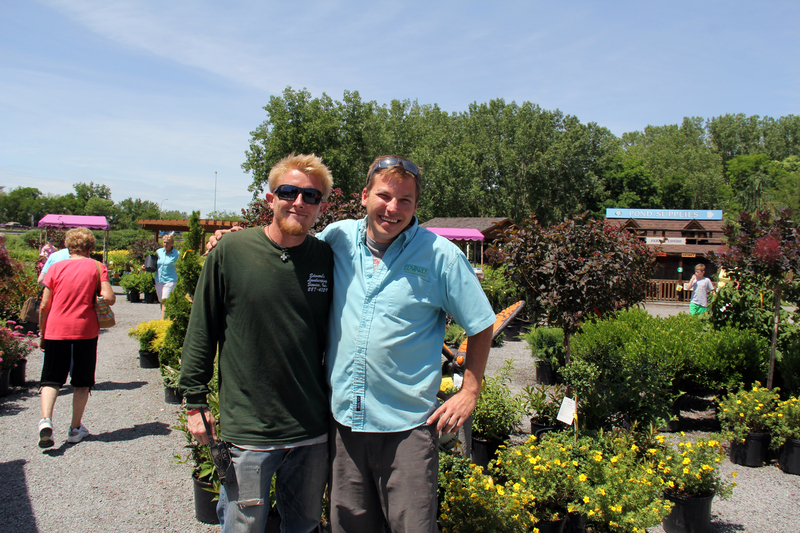 Edward’s Garden Center staff if also excited to announce a new service, “We plan, You Plant”. This new service is a great one for any avid gardener or DIYer. Stop into the Garden Center with a drawing of your yard and our staff will help you design your garden. Then you chose all of the flowers and shrubs that you want and we will deliver them. You plant them and send us your after pictures for us to feature on the website. Speaking of the website…The last thing we are going to clue you in on is our new website! In the off season, Ed has been working with a company to create a new website. It will have an awesome new look, videos and tons of great information! Check edwardsgardencenter.com next week and let us know what you think! Hope everyone is getting excited about spring! We sure are! It’s going to be a great year so make sure you come “Explore and Enjoy” the Garden Center and don’t forget to bring your friends. Categories: Edward's Garden Center News & Events | Tags: Annuals, Edward's Garden Center Forty Fort, events, fountains, Garden Center, new website, water features | Permalink. Plan your tea garden now so you’ll be warm next winter! These below freezing temperatures have us thinking of ways to keep warm! Cuddling up on the couch with a blanket, a laptop for Pinterest and a nice cup of hot tea is a must. Grow your own tea garden for delicious and beneficial tea all year round. Speaking of tea….have you ever considered growing a tea garden? Sure it’s easy enough to go to the store and purchase tea bags, but where is the fun in that? If you grow your own herbs for tea, you can mix and match to create your own tasty blend. You may also find that herbs grown in your own garden can be more flavorful than the ones you would buy in the store. If you want to plan your tea garden for next year, you should think about what types of herbs you want to grow. Bee Balm (Monarda didyma), a member of the mint family, is native to the eastern United States and Canada. Betony (Stachys officinalis) bears two- to three-foot spikes of violet flowers. The deep green, hairy leaves make a slightly astringent tea that’s similar to a mild, fragrant China tea. Coriander (Coriandrum sativum) produces seeds that lend a warm, citrusy flavor to tea. The leaves, used in cooking, are known as cilantro or Chinese parsley. Chamomile bears small, daisy-like flowers that have long been used in Europe for tea. Lemon Balm (Melissa officinalis) is a floppy two-foot-tall member of the mint family has scalloped, lemon-scented leaves that make a soothing evening tea and add body to blends as well. Mint (Mentha spp.) comes in many varieties, all of which have been used as teas. Peppermint leaves (M. x piperita) seem to be the only ones that stand up to drying and steeping, making a wonderfully refreshing iced tea. Yerba Buena (Satureja douglasii) is a low-growing perennial with wonderful menthol-mint-flavored leaves. The plants listed here can all be used fresh for tea, or they can be dried first. To dry them, spread the stems on trays in a warm, airy place and turn them twice a day. When they’re dry (four to eight days), gently strip off the leaves, buds or flowerheads and store them in closed containers. After the leaves a dry, you can mix them and make your own concoction. For some classics try recipes see the graphic above. Creating your tea garden this coming season will ensure that you have warm, delicious tea year round… and especially when you need it on a cold winter night like this. Categories: Gardening Fun and Related Topics, Gardening Tips & Tricks | Tags: Ed's Garden Center, Edward's Garden Center Forty Fort, herbal tea, tea gardens, tea recipes | Permalink. Just because Diane Donnelly is one of the most recent people to join the Edward’s Garden Center team does not mean she is any less experienced or enthusiastic about gardening. Diane was chosen to design a container garden and represent Edward’s Garden Center on WNEP’s Home and Backyard. Diane’s love of gardening began at an early age. She remembers her mother and grandmother having her help in the garden since she could walk. In fact, her early introduction to gardening is why she credits her mother with being her inspiration for many of her gardening projects. Diane’s mom still enjoys planting well into her 70s. Professionally, Diane has been working for garden centers for years. Before coming to work at Edward’s Garden Center last spring, she worked for another one for eight years. As a hobby, Diane has over 30 years of experience designing gardens. At the Garden Center, Diane is responsible for the upkeep of the annual greenhouse. She takes care of the plants, waters and restocks when necessary. She also designs container gardens, plant arrangements and helps customers with whatever questions they have. Helping customers design a container garden that they love is something she is passionate about. One of Diane’s favorite things about her job is pitching in wherever she is needed. As many of Edward’s customers know, owner Ed Kopec is quite fond of water features. Diane and Ed are in complete agreement on this subject. That’s why she is most excited about the huge water feature that is being constructed at the Garden Center for the new season. While Diane loves incorporating water features into a garden’s layout, she also has other tastes that often find their way into her designs. Her personal favorite style of garden, that often creeps into her designs at home, is country eclectic with a hint of whimsy. Another personal favorite for her home garden is planting bushes and shrubs to attract hummingbirds and butterflies. At home, Diane has a large property that is a continuous work in progress and she wouldn’t have it any other way. Diane is such an inspiration to our customers and our staff. I hope everyone enjoyed reading about her experience and her job at the Garden Center. 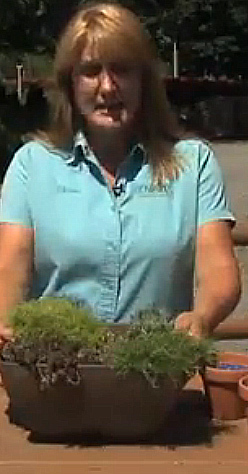 In case you missed it, Diane represented Edward’s Garden Center on WNEP’s Home and Backyard this past summer. Take a look at the video on WNEP’s Home and Backyard site here: http://wnep.com/2014/11/01/seasonal-planters/. Categories: Edward's Garden Center News & Events, Gardening Fun and Related Topics, Gardening Tips & Tricks | Tags: Diane Donnelly, Ed Kopec, Edward's Garden Center, Edward's Garden Center Forty Fort, expert gardeners, water features | Permalink. Aromatherapy uses plant materials and aromatic plant oils, including essential oils to help with altering a person’s mood and cognitive function. They can aid people who have various ailments, from headaches to anxiety. Aromatherapists, who specialize in the practice of aromatherapy, utilise blends of therapeutic essential oils that can be issued through topical application, massage, inhalation or water immersion to stimulate a desired response. Aromatics are made from organic compounds and were once thought to treat infections. Since then it is believed that aromatherapy impacts the brain more than our immune system. It is believed that aromatic compounds are absorbed through the olfactory system and interact with the brain’s limbic system, creating a minor and temporary change in brain chemistry. 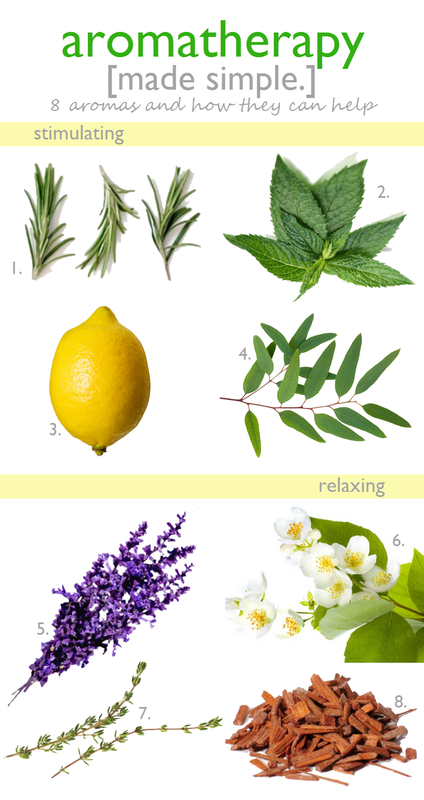 Some of the main aromatics may be growing in your garden. 1. Rosemary: Rosemary is thought to stimulate the brain and improve mental performance. 2. Peppermint: Peppermint oils are known to relieve mental fatigue, enhance alertness and enhance memory. 3. Lemon: The uplifting aroma of lemon has been known to enhance mental clarity and reduce stress and depression. 4. Eucalyptus: The essential oil of eucalyptus is most commonly used to open the sinuses and bronchial passages. It is also used to relieve headaches and mental fatigue. 5. Lavender: One of the most widely used essential oils, lavender is uplifting and relaxing. 6. Jasmine: Jasmine is used to fight stress and anxiety and as an antidepressant. 7. Thyme: The essential oil of thyme may help improve memory and concentration. It has also been know to relax the nervous system. 8. Sandalwood: Sandalwood is often used to calm the nerves and induce relaxation. It has very spiritually warming properties. Oils are the most common application for aromatics, but they are not the only way to benefit from these herbs and plants. Some of them can be applied topically, in the form of lotions and others are so potent that simply having them in the same room with you, will allow you to reap their benefits. Growing plants to be used in aromatherapy can take a special hand. While many of the plants listed above are not difficult to grow, getting the most out of their aromatic properties can take special care. For example, you will need to plan and research which plants can share the same airspace. Allelopathy occurs when a plant releases chemicals to prevent competing vegetation from growing within its area or zone. Before you plant Peppermint and Lavender together, check to make sure they are not competing for pollination by the same insects. Do your research and you will grow extremely fragrant plants. Once you are ready to harvest your plants, you can easily make your own oils. Cut the herbs or flowers that you want to use and gather some clean jars. If you want a stronger smell, add some new herbs and put it in the jar to sit for a while. Categories: Gardening Fun and Related Topics, Gardening Tips & Tricks, Uncategorized | Tags: aromatherapy, aromatherapy in your garden, Edward's Garden Center, Edward's Garden Center Forty Fort, herbs, lavender, sandalwood, thyme | Permalink.